Are you looking for a great natural beauty and health supplement for your body, skin and hair that really works? Coconut oil supplements could be just what you need to speed up weight loss, boost your immunity and get your skin and hair healthy and glowing again. Organic, cold pressed virgin coconut oil is one of my favorite healthy superfoods I can use for almost everything! This healthy superfood is an oil that can be consumed for health and beauty, used as an alternative cooking oil in the kitchen as a healthy cooking oil, used topically as a hydrating face and body moisturizer, hair treatment and smoother, diaper rash treatment and so much more. You can read more about how to consume coconut oil here. Coconut oil is a healthy saturated fat with medium-chain triglycerides that boost energy and speed up your metabolism. These are broken down quickly by the body and converted to energy, not stored as fat in our bodies like health professionals once thought. MCT's are known to help reduce hunger, and even help you to feel fuller, faster. Other benefits of coconut oil supplements can cause healthier hair growth, stronger immunity, better digestion, improved brain function, disease prevention, stress relief, and more stable blood sugar levels. Coconut oil contains a 50% lauric acid which is anti-bacterial and anti-fungal. Consuming organic, cold pressed coconut oil is essential to get all the nutritional benefits of this healthy superfood. Otherwise, all the nutrients are removed in the refining process and your wasting your money. 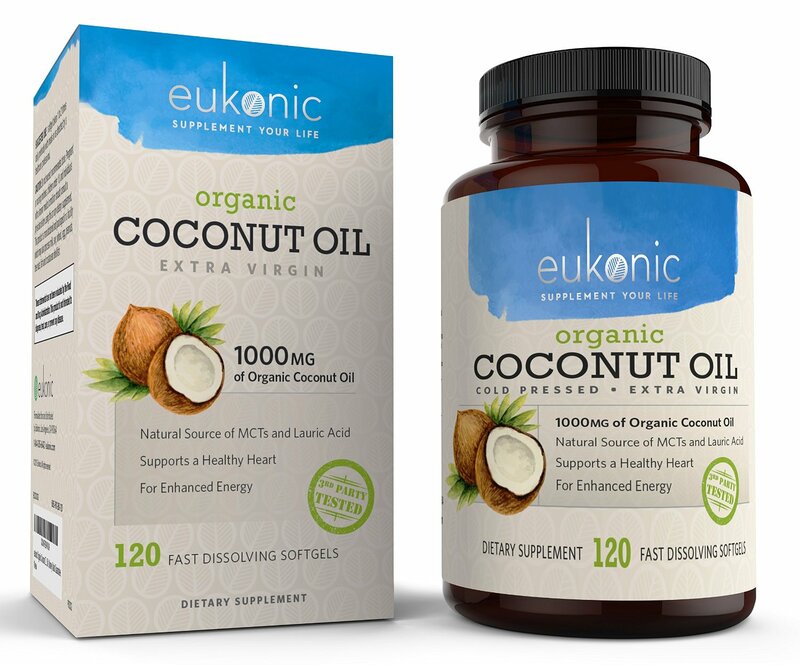 Eukonic uses only the purest Organic Cold-Pressed Extra Virgin Coconut Oil in their supplements. This is literally the most nutrient-dense kind of coconut oil you can purchase. Since these supplements are cold-pressed, no nutrients are lost due to heating or processing. They are also preservative free, non-gmo, soy and yeast free and made in the USA. You can enjoy all the benefits of coconut oil just as Mother Nature intended. I've been taking the Eukonic Organic Coconut oil supplements for two months now and see a big improvement in my skin and hair! My skin is glowing and it looks like I'm drinking a lot of water. My hair is smooth and less frizzy and much healthier despite dying it several times. So if your not a fan of the way coconut oil tastes or just need an easy way to consume it without a mess, these supplements are a perfect way to get your daily dose of this healthy superfood everyday. 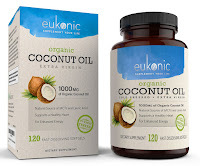 You can purchase Eukonic Coconut oil supplements on their website or at Amazon.com. It is hundred percent true. Even if you massage your skin with coconut oil the one can see improvement. This medicine is looking good.